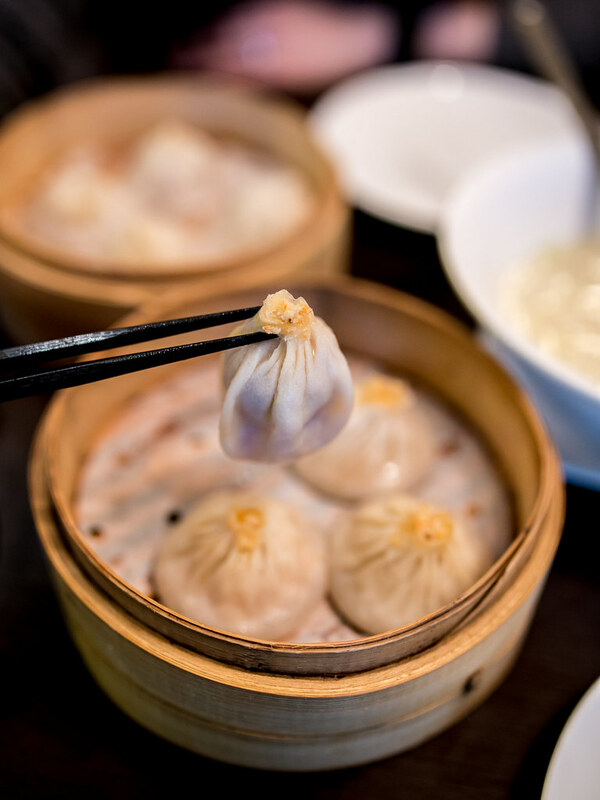 Hailing straight from Shanghai, Yu Garden is the first North American outpost from Nanxiang Steamed Bun Restaurant, a famous eatery located in the old Chinese district of Shanghai. The Richmond Hill restaurant is the first of 15 planned North American locations to come in next few years. While I was in Shanghai this year I stopped by the original eatery, established in 1900, to try their infamous giant soup dumpling. For that food memory, we had to brave crowds of tourists, a long queue and rain. 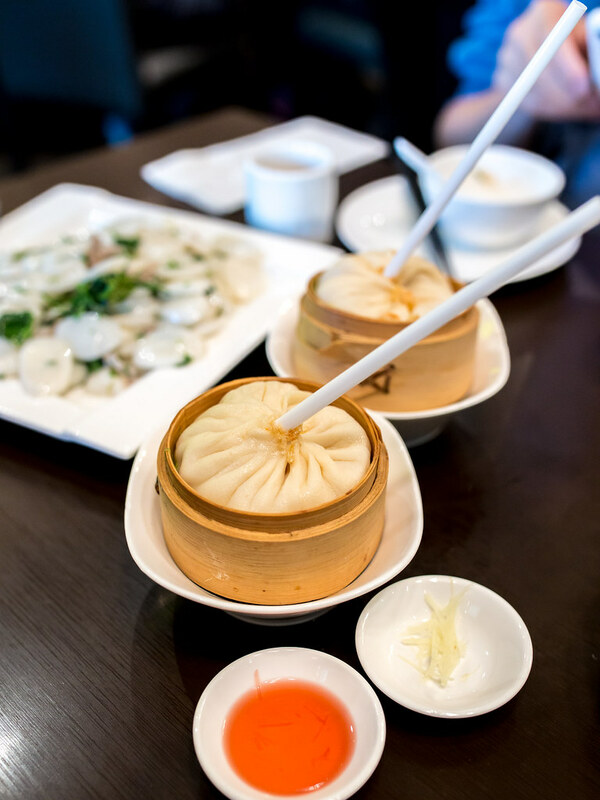 When I heard Yu Garden was opening, I was eager to get my hands on more tasty xiao long bao in a much more comfortable setting, closer to home. Atmosphere: Yu Garden’s decor was modern with leather chairs and square tables but also classic with chandelier lights and laser cut wood decor. A private room with glass walls was set in a corner of the dining area, housing a couple of large round tables. We did not have a reservation, but arrived at 12:30pm on a Sunday and was able to get a table without waiting. 15 minutes into our meal, a queue had formed at the entrance. The Hubby and I have eaten at Yu Garden again and on our second visit, while we didn’t have trouble getting seated, again a queue had formed outside before we left. I’d recommend reservations or going before mealtime rushes. Service: Service was standard for a Chinese restaurant, efficient and perfectly acceptable. I found the servers curt but dishes arrived quickly and for the most part we could flag them down. While we ordered in English, I heard Mandarin and Cantonese accommodated. 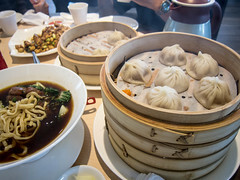 Food: To start, we ordered two steamers of xiao long baos, shrimp and pork and crab roe and pork. We also ordered one King Size Crab Roe soup steamed dumpling. 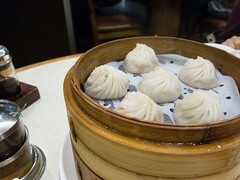 Each steamer came with 4 baos (prices ranged from $1.00 to $1.50 per bao) and one sauce of shredded ginger. Pink vinegar was setup at each table. 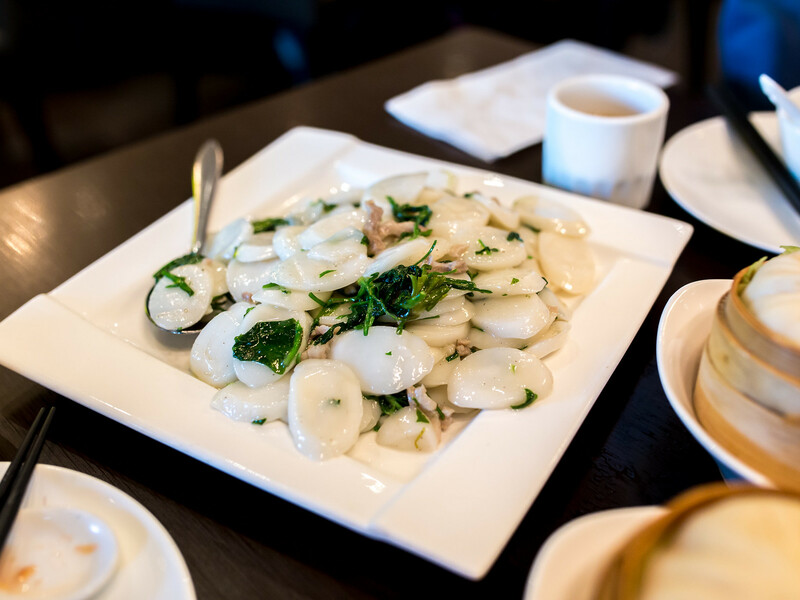 Before diving into other dishes, let’s focus on the baos. These were phenomenal. The skin was thin yet a perfect texture and held together even with a little manhandling by chopsticks (to get the best picture of course). When picked up, they drooped and then puddled when dipped in the saucer. 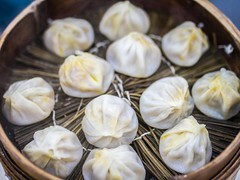 Each xiao long bao was filled with hot savoury soup. 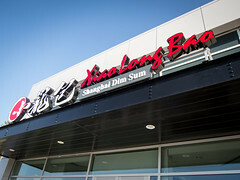 For me, the xiao long bao were the best I’ve had so far in Toronto. Still no competition to Jia Jia, but very good. On our first visit, I liked the crab one more and on our second, I found the minced pork tastier. I would have liked a bit more crab flavour. Meanwhile, the king size soup dumpling was disappointing. The scalding crab roe soup was pretty bland. There was a lot of soup, but lacked flavour. Not as good as the one in Shanghai, or even close. 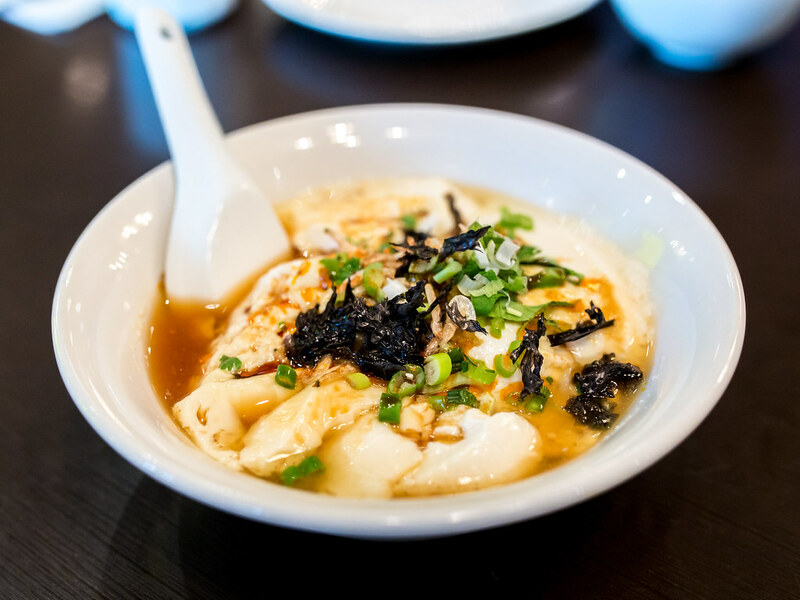 We also ordered the salty tofu pudding, one of my favourite Shanghai street foods to have for breakfast. The dish at Yu Garden tasted authentic with dried shrimp, seaweed, chilli oil, preserved vegetables and green onions. 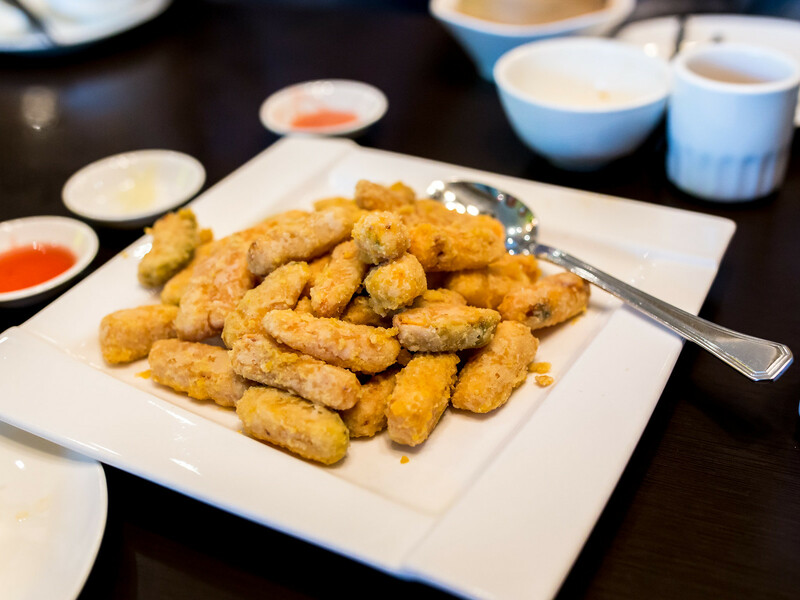 To round out our meal, we tried the deep fried salted egg yolk pumpkin and rice cakes. Both dishes were underwhelming. 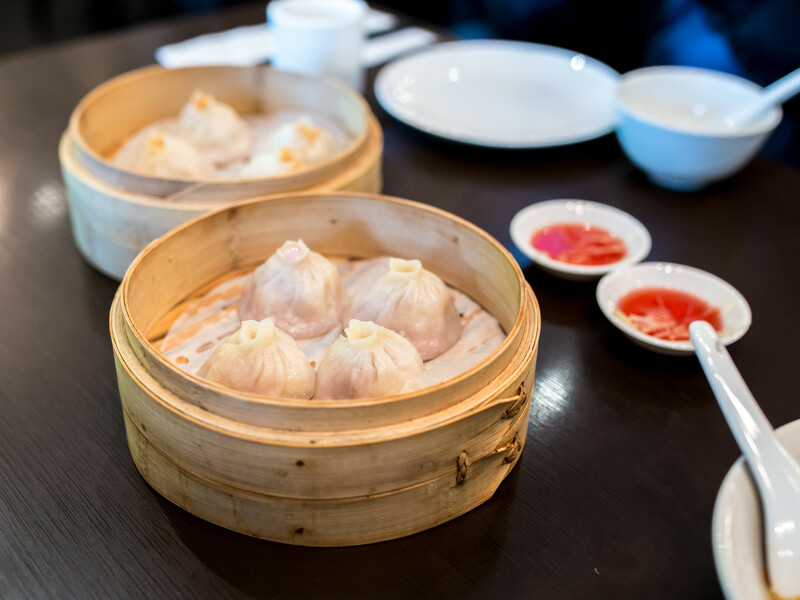 I prefer Shanghai Dim Sum‘s version of both dishes. With the pumpkin, sugar was added to to the batter, which distracted from the salted egg yolk. The pumpkin itself was already sweet enough. On the other hand, I the rice cakes had no wok air and used fresh sprouts instead of preserved cabbage. The rice cakes had a good texture, but I felt the dish was lacking something. 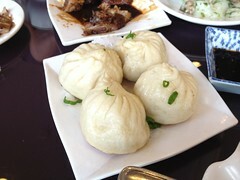 I saw plates of sheng jian bao being served at other tables and wasn’t enticed to order. Overall, I’ll definitely be back to Yu Garden for their xiao long baos and simple Shanghai dishes. I’ll be skipping the king size dumpling which was mostly gimmick.